“Sea” the Latest Videos Fresh From Motts Channel Seafood Studios! Like our “recipes”, “how to”, and “about us” videos! This page offers lots of inspiration for your next seafood meal. Have you had a chance to catch Flavor, NC is a television series dedicated to preserving and celebrating North Carolina’s agricultural heritage, one dinner plate at a time? 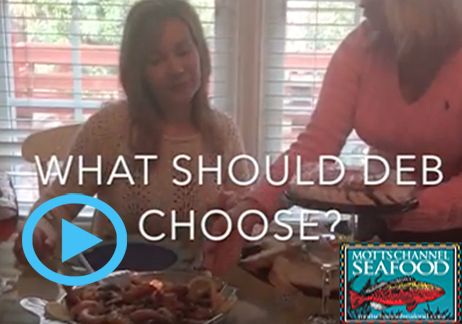 When the show’s creative team wanted to highlight Southeastern NC seafood, they came to see us. Owner Gene Long took show host Lisa Prince on a fishing trip and then Alison Long showed her around the store. Then the crew drove over the bridge to our very good friends at Ceviche’s where Executive Chef Scott Surratt showed them a few amazing recipes. We think Flavor NC did a great job with this episode and hope you will take the time to watch and share it. 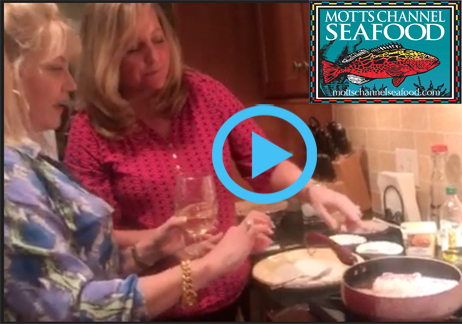 Motts Channel Seafood’s own Alison Long, together with good friend Beth Lennon, discuss The NC Azalea Festival’s Garden Party as well as sharing a delicious recipe. Click on the blue icon below to view our videos and learn how to make a “Garden Party” Salad with chilled rice and fresh seared scallops. Our latest video recipe is here and it is a perfect dish to make tonight (or any night) for you and your special someone. Click on the blue icon below to view our videos and learn how to make Hognose Snapper in a Red Pepper Cream Sauce. This episode is hosted by Alison Long with special guest Dale Lacy. Enjoy! This video recipe is here and ready or your Super Bow 51 parties! Click on the blue icon below to view our video and learn how to make New Orleans Style Barbecue Shrimp. This episode is hosted by Alison Long with special guests Deb Church and Beth Lennon. Enjoy! This episode is hosted by Alison Long with special guest Beth Lennon. Enjoy! This episode is hosted by Sam Cahoon, Executive Chef at Ceviche’s Wrightsville Beach. Enjoy! This episode is hosted by Motts’ own Alison Long. Enjoy!